Paddy Power are Europe's fastest growing online bookmakers. Their core business is horse racing and it shows in their comprehensive and innovative mobile racebook app for all phone and tablets. Compatible with iPhone, Android, Blackberry & more. Dedicated tablet version. Mobile live streams from South America, South Africa, Dubai, Ireland & the U.K.
​Partnership with the Racing Post provides tips and detailed race overviews. 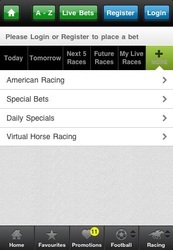 The most popular horse racing and sports betting app in the United Kingdom. Paddy Power has been one of the world’s leading bookmakers for a number of years now. Whilst they are a predominantly an Irish based bookmaker, they have managed to extend their reach into markets including the UK, Europe and around the world. Part of their success has been down to their keenness to provide their customers with innovating products. In more recent time this has come in the form of mobile betting and their latest betting app is available on a host of smartphone and tablet devices. As a backbone to the company, Paddy Power have invested a lot of time and money into providing a series of comprehensive betting markets, none more so than their horse racing section. This is a follow up to their Irish roots where the sport is massively popular. Their betting app is largely based around their horse racing section and is easily one of the leading apps within the sport. Once into the app itself you will be greeted with a host of sports to choose from. 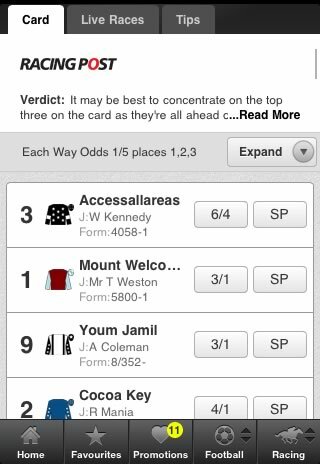 But straight away you will see that the majority of the app is geared around their horse racing section. It includes races from around the world to accompany a host of features throughout the app. The first thing you will come across is the racing ‘Today’ section where a list of races for that given day is on offer. These will be listed within the place where the meeting is taking place and you can expand or collapse each meeting. The races are listed with the time of each race along with the name, length of the race and often the horse criteria (usually weight or rating). Another interesting addition to this is the ‘Watch’ button where you can stream the races live, but we will discuss this later in the review. 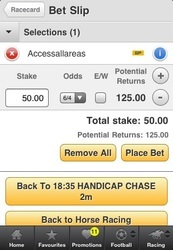 From the racing home section you can choose to view race cards for the following days meetings, the next five races that are upcoming for that day, future races (which is similar to Ante Post betting including some of the larger meetings) and also the My Live Races section which shows you which races you can view live from your mobile device. Additionally there is a ‘More’ button that allows you to flick between American racing markets, special bets, daily specials and even Paddy Power’s virtual horse racing section. 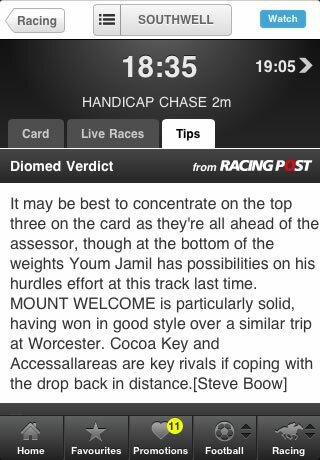 The app really comes alive once you get into the race you want to bet on and start to take advantage of the extensive race cards that are on offer. Paddy Power has managed to team with the Racing Post –one of the UK’s leading horse racing magazines – to bring you a free overview of each race. This often takes into account the form of horses, jockeys and trainers in the race, whilst also looking at the ground in question. Whilst these are normally just about a couple of sentences or so, they are written by real tippers from the Racing Post so they do carry a fair amount of weight with them. The card itself allows you to also view information on each horse. This includes colours of the jockey’s silks, name of the horse, jockey, form, race number and latest odds. But, by clicking on your horse – or simply by selecting the ‘Expand’ button – you can see a lot more detailed information on that horse. This includes a short write up on how they might perform on the race and more detailed overview of their previous races. 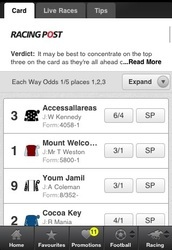 The bottom of each race card will include a list of other markets in which you can bet on for that race. 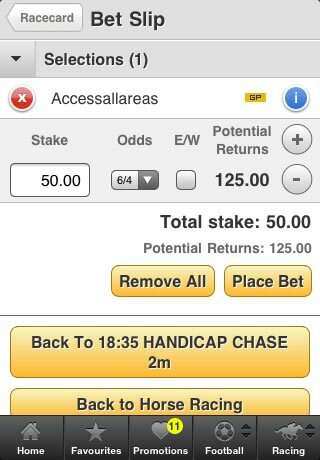 Typically these will include Place Only 2 Places, Insurebet 2 Place, Betting W/O (often without the favourite) and Match Betting (allowing you to go head to head with other horses). We briefly mentioned about the live streaming service that’s available on the Paddy Power app, and this is on offer for all Paddy Power users. 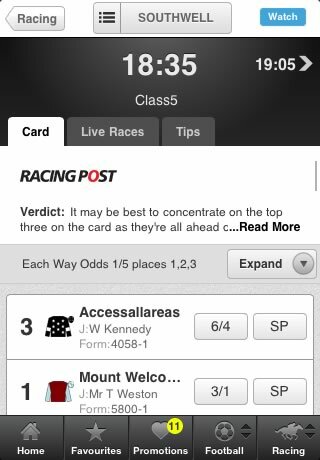 The only criteria that you need to make is to place a minimum of £1/€1 bet on that race and you can then stream it directly from the app. The races that are available will include a blue ‘Watch’ button next to the race card and providing you have made a wager on that race, before being taken to the live stream. It’s worth noting that the stream can be up to 10 seconds behind the live broadcast, so betting in play is probably not going to be best suited for use alongside this feature. 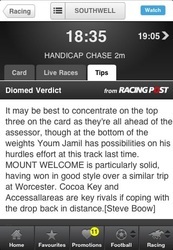 The final part of the race card is a tips section, again taken directly from the team at the Racing Post. For each race you will be given around about a paragraph on who they think will perform well in the race. This goes alongside four additional picks from a series of tipster as to who they think will perform well and where the smart money will be going. You can obviously compare each tip before the app provides you with a quick bet section to back who the professionals think will do well. The Paddy Power app is one of the best in the business for a reason; and this is mainly down to how well it looks and also performs. Over the years the app has continued to evolve, and to be honest in the early days it wasn’t up to much. 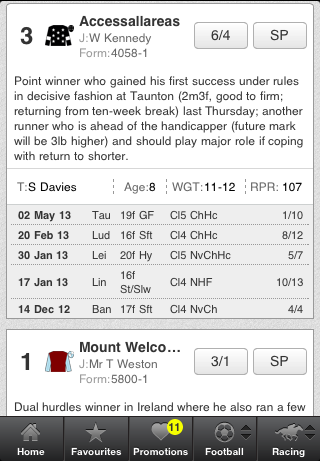 This has all changed now and the app takes pride and place near the top of the betting app pile. The horse racing section is a simple one, but functions really well. Its clear layout makes it easy to jump between hosts of races, from meetings all over the world. The race card again is stunning and it allows you to see as much information on the screen at any given time as you like. 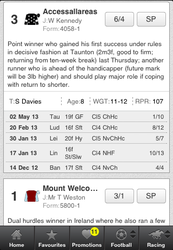 The addition of extra navigation buttons such as the back, home and racing section allows for navigation to be so simple and something that many bookmakers actually fail to incorporate into their app. Horse racing has played a massive role in the success story that is Paddy Power. If they created anything that was remotely sub-standard on their betting app for horse racing then it simply wouldn’t have been good enough. Luckily they have managed to make one of the most diverse and comprehensive horse racing apps on the market and have pretty much left no stone unturned. 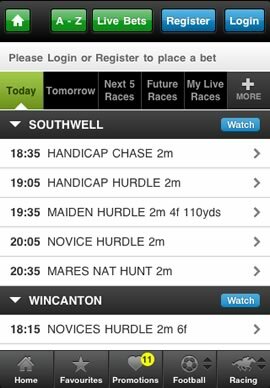 There is very little missing from the app that a horse racing fanatic would need to make calculated decision about which horse to bet on. Everything is available on the app, and aside from actually signing up to a site like the Racing Post for the real in-depth analyses of each race, the Paddy Power betting app will more than suffice the majority of horse racing punters needs.